To carry out this process step specific design features are indispensable, which, as the name implies, the backflushing rotor completely covers. In the century of micro- resp. nano-technology this process step cannot be realized with a vertical peeler centrifuge with sieve basket. Thus the vertical peeler centrifuge can only be limitedly used or possibly not be used for the process of the innovative micro- and nano-products. Well-founded on such conditions it can be rightly asserted, that with consideration of sustainability resp. usability vertical peeler centrifuges have their right to exist only for minor process steps. The necessity of a regeneration of the residual layer is resulted by the processing of permanently finer products as well as by the fully automation of process chains, that means the machines have to produce for a longer time fully automatic with high repeat accuracy and without personal support resp. human intervention. The basis for this will be described in more details. During the batch operation finest particles, crystal breaks as well as impurities are concentrated to the heel cake. Furthermore a so-called glazing effect in the peeling level is given. Through these influences, which can massively occur especially during the processing of very fine products, over time in many cases a significant increase of the filtration resistance and also a considerable increase of the capillary rise is made. The results are on the one hand high residual moisture of the filter cake resp. an essential extension of the batch time and/or a considerable increase of the residual moisture of the heel cake. This appearance implies a thixotropic resp. dilantant behaviour of this layer in many cases. Then a fully automatic discharge is understandably not possible and this process results in a sticking of the discharge devices as well as also the chute resp. screw and all following aggregates. The process comes to a standstill. The follow-up costs are conceivable. In order to prevent this safely over a long time period, horizontal peeler centrifuges with backflushing rotors will be used. As this phenomenon in the heel cake resp. in the peeling level is depending of the way of operating the centrifuge as well as of the processing product, this step has to be executed highly variable under financial aspects. That means only if an appreciable increase of the filtration resistance is given a backflushing process, which understandable costs time and money, is fully automatic started by means of collected experiences. 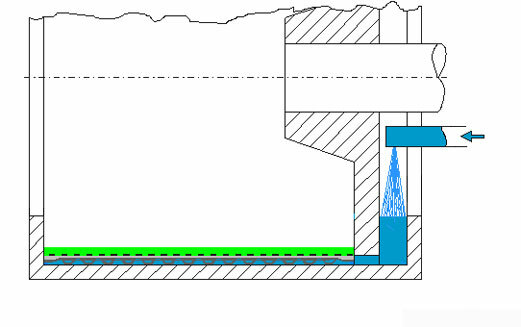 Normally therefore a backflushing rotor is accelerated onto the predefined filling speed (backflushing speed = filling speed). Backflushing of the filter agent by starting off a backflushing process after discharging of the rotor. After receiving the signal “speed achieved” the filtrate peeler device pivots out of the backflushing chamber. At the same time the backflushing valve is opened with a time delay of 1-2 sec. Now a defined quantity of backflushing liquid is feeded into the backflushing chamber during a predefined time (normally with 5-15 sec.). Among other things this quantity is depending on the geometrical conditions of the backflushing rotor as well as of the filtration element and the process-related preselected height of the heel cake. During this process the backflushing medium follows the law of the communicating tube, i.e. 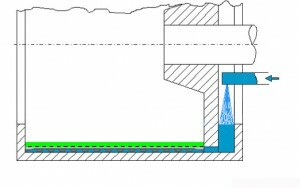 the pressure, built up under rotation in the flooded backflushing chamber, causes an accelerated exchange of liquid between the backflushing chamber and the cake, whose connection will be realized by channels installed in an advantageous way at the rotor bottom. At the end of this process a nearly same level of liquid is adjusted in both rotationally-symmetric areas. Watching this through-flow process of the heel cake through the viewing glass, which is installed at the centrifuge door, a change of colour at the peeling level must be visible. This change of colour can also appear as a shiny surface. Directly after the backflushing step follows filling by opening of the feed valve. The tangential filling flow feeded by filling tube I of the combined function unit resuspended the heel cake softened by the backflushing process. Coarse and fine particles will be mixed. A filter cake is formed. With opening the feed valve the pivoting of the filtrate peeler device into the backflushing chamber is made with time delay. So at the beginning of the filling process a pure sedimentation of solid particles is made possible and a unbalanced-free resp. unbalanced-low rotationally-symmetric filter cake is build up. The result is a vibration-low run of the centrifuge and due to the idial cylindrical cake shape a uniform dewatering as well as a possible necessary washing process. Thus the backflushing concept ensures a fully automatic operation of the Krettek horizontal centrifuge realized with a high repeatability, which is stable over a long time.